This week it’s all about showcasing vegetable versatility. I’ve always said you are what you eat. When I’m in the restaurant, I always taste as much as I can. In fact, it’s one of the most important things a chef can do, always taste as you go. It’s the one of the best rules that will help set you up for success so that by the time you have a finished dish, you’ll know each component is perfectly seasoned and balanced. That being said, because I try to taste as much as I can, by the time I get home, I try my best to eat a balanced healthy diet full of vegetables. When I’m home, I actually eat a mostly meat free, pescatarian diet. Growing up, my mom always taught my brother and I that vegetables were the stars of the dish and that every other complement should complement the main vegetable. Eggplant serves as the star in today’s dish. 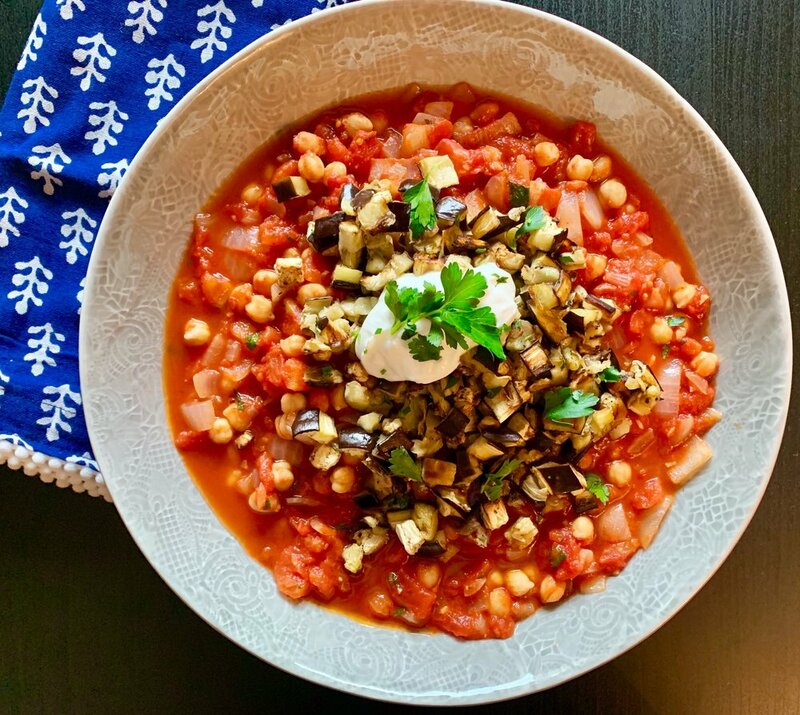 I chose to roast it so that you can really taste the crisp sweetness as it is served on top of the chickpea and tomato stew. This dish is one of those any season any meal dishes. Eating it for breakfast? Add a poached egg? Bringing it for lunch? Add a slice of toast. Making it for dinner? Serve it over your favorite grain or pasta. Like most vegetables, this dish is incredibly versatile and if we are going to be honest, which we all know I always am, it can’t get much better than that. But this dish is so much better beyond it’s versatility. It is packed with nutrition. From the olive oil to the chickpeas and the eggplant you really get a nutrition bang for your buck. And speaking of money, it’s easy on the wallet and your time. It comes together quickly so it is perfect for the quick weeknight dinner. I’ll let Becca my PR/Marketing and Nutrition guru take it away with the nutrition here! Thanks Chef! This is one serious nutritious and delicious dish. When we chatted about using it for a blog, I knew this was going to be a hit. I loved it when I saw you tweeting about it a few months ago! I love it because as you said, it’s so versatile and can really be eaten at any meal of the day. Chickpeas are one of my favorite vegetarian ways to sneak protein in because just one cup packs in about 15 grams of protein. Plus, did you know that by rinsing the chickpeas prior to cooking, you can reduce sodium intake by about 50%? It’s great trick for those trying to watch sodium intake. Eat Well With Ming:Did you know that cooking San Marzano tomatoes in olive oil helps increase its anti-inflammatory properties? 2. Season the eggplant with salt and pepper. Oil a sheet tray and bake for 20-30 minutes, until the eggplant is nice and crispy. 3. While the eggplant bakes, in a sauté pan add the onion and sauté until caramelized. Add the ginger and garlic and gently sauté. 4. Add the chickpeas and tomatoes and mix well just to warm the chickpeas through. 5. Once the eggplant is baked, remove from oven. 6. To plate, add the stew to a bowl and top with eggplant. Serve with dollop of full fat Greek yogurt, garnish of fresh parsley, a hunk of your favorite baguette or grain and eat hot.